IMG_7913, originally uploaded by Pink Lady on the Loose!. 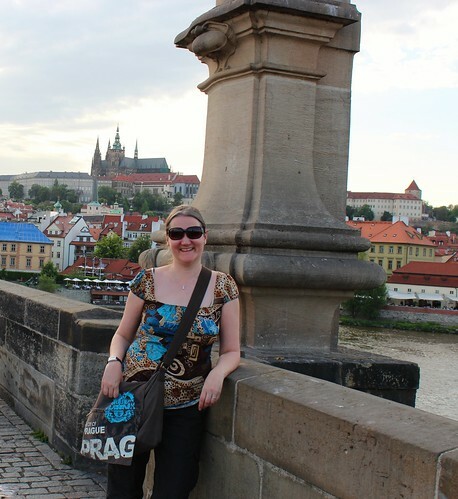 Pink Lady at Charles Bridge in Prague, which is in fact one of my fave places on Earth. My husband and I spent the weekend in Prague in order to celebrate our fifth wedding anniversary. The bag (actually a men's bag) was a souvenir from this trip. The top is from a thrift store in Finland, the sunglasses bought years ago from Bangalore, India and the pants are a recent purchase from Helsinki, Finland. The brand is Nomad, and I absolutely adore them. They were super-expensive, eventhough I got them at half off. But they're really worth it because the quality is superb: they're 100% cotton, yet they are wind and rain proof and even offer protection against the sun and against mosquitoes.